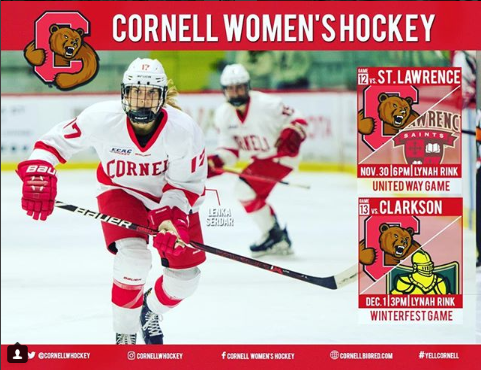 Support Cornell Women's Hockey with a pair of matchups this weekend, including Saturday afternoon's match to celebrate the 2nd Annual Winterfest Game! The first 500 fans will get a free t-shirt. Enjoy donuts, cider, and prizes, too! Immediately after the pregame warmup, gather in Newman/Lynah foyer for the ugly sweater competition and then it’s game on against Clarkson at 3pm! Tickets are available at cornellbidredtickets.com.